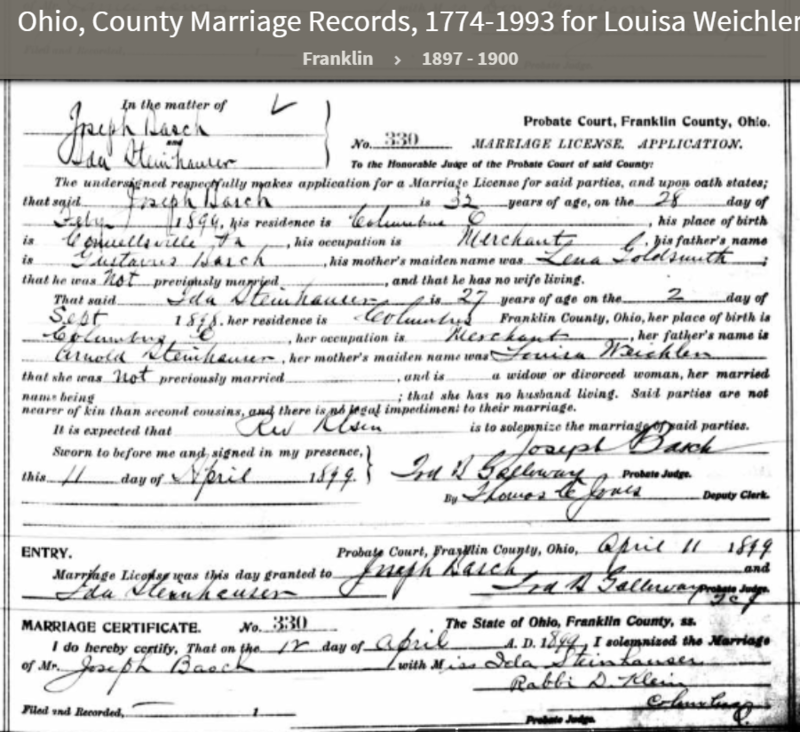 This entry was posted in Genealogy, Goldschmidt/Goldsmith, Ohio and tagged Basch, Columbus, findlay, Goldschmidt, Ohio, Shatz by Amy. Bookmark the permalink. hmmm, I noticed Joel and Jeanette named one of the children Sydney ‘Louis’ and Frank and Freda had a son named ‘Lewis’ (which could have been spelled, Louis ? c worker mistake? Makes me think that there could be more to this Louis than Lena taking on a pseudonym. According to the death record for Gustavus Basch, his father was named Louis so the grandchildren named Louis/Lewis were likely named for him. 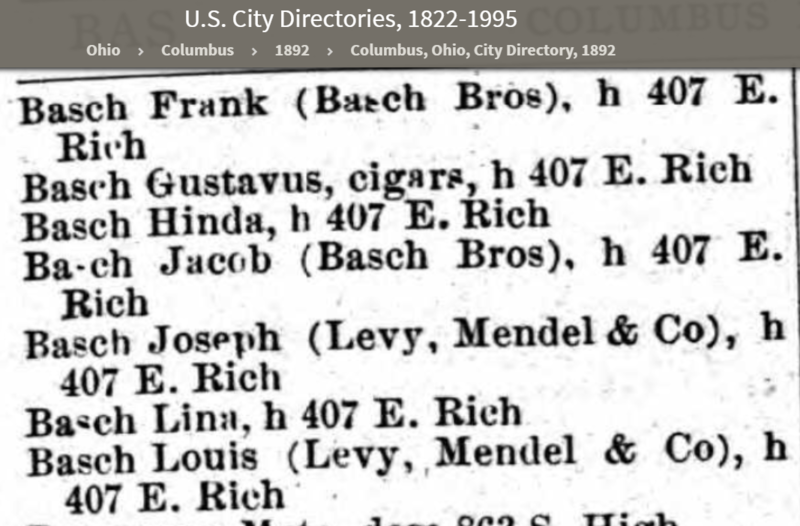 As far as I can tell that original Louis Basch never left Germany, so could not be the one in the directory. And there was never a Louis Basch living with the Basch family on any census record. I think you may be on to something concerning Lena possibly using Louis in business especially since you found no trace of a person by this name. Thanks, it’s the only thing that makes sense to me, especially since we know that in the 1880s the business was known as L Basch and Sons. I agree. Used initial and then name Louis. In those days unusual for a woman to own a business! I like your creative thinking! A male pseudonym would be a solution to some of the gender-related issues of owning a business in that time period. Good luck finding more concrete evidence! Interesting about Rachel being known as Rae. My grandmother had an “Aunt Ray” and I couldn’t figure it out until it hit me across the face – Rachel. If only I’d read your blog first. LOL! I have seen it so many times now that I generally assume all women named Ray or Rae were born Rachel. And I’ve even known living Rays who were born Rachel (not of our generation). It always seems odd to me–Rachel is such a beautiful name—and Ray is so masculine seeming. But less Jewish, I suppose.